I went to 48 Rue du Fauburg St. Honore, the place of Anatomy Fashion. Door was locked. I walked on to Place de la Concorde. It took 7 minutes. La Grande Roue is Back! I walked on to the corner of Rue de La Chaise and Rue de Varenne, the place of "Art". That walk took 20 min. Disappointed that I could not get in to Anatomy, and late for lunch at Le Cinq, I took a taxi back to "Fashion". I asked the driver to wait. He was not happy but he said three to five minutes "okay". This time I read a little note by the doorbell that said words to the effect "Press to Enter". Buzzzz. Nothing. Repeat. Rethinking: buzzzz, push!! That was the trick. The door opened. I went up the stairs, many stories, all the way to the top. Each floor had one and only one black door. But no "Anatomy" sign on any of them as there was in the show. I should have made an appointment. So, sorry Peach, no jacket souvenir. And the door would not open to let me out! I was waving to passersby to get them to open the door for me. Turns out there was another buzzer button you had to press to get out! Firetrap I say. Yes lots of lights! But those pictures sucked. I still need to get to know my camera. This was where the cluebox was at Place de la Concorde. How the hell did we not see this in the previews? About the Mozambique blog, my guess is that is was posted Friday December 8th at 11:36 am. GE even has the "ring of cannons"
A Quito blog from a Canadian exchange student. Nothing much new. Good find Slowhatch!! Dec 8th is when the blog entry was posted. Some friends of mine are Peace Corps vols in Mozambique and claim that the race came through Maputo sometime between Thanksgiving and December 7. 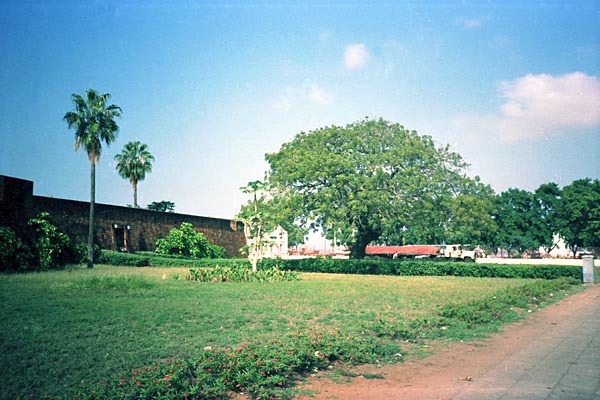 One of the destinations was the old Portuguese fort (pictured here: http://tabisite.com/gallery_af/mozambique/91af265.jpg). Unfortunately they didn't have any other details. This does seem consistent with the spoilers that teams were on their way to South Africa, as Maputo is usually reached through Joburg. GEORGIA PEACH, your comment that "my map shows that U-shaped island as North Bay Island so it is a miracle I was in the neighborhood at all!" underscores the serendipity factor at work here. According to Google Earth, which I will take as a reasonable expert even though they don't label Pelican Island as such, North Bay Island is that portion of the island which is south of the causeway. The part that is north (the U-shaped part) is Harbor Island. It is quite unusual to have one island split into two names like that. I expect leg 4 to involve a trip from Punta Arenas to Ushuaia. LAN 997 takes only 50 minutes but is available once at 1400 on Monday, Wenesday and Saturday in that direction. I also decided to take a crack at leg 5, which I expect to be from Ushuaia to Maputo Mozambique (Note: I disagree with those who think there is going to be another pit stop in South Africa). Here there are basically two choices and only one makes any sense. the non-sensical one involves getting the direct flight to Maputo from Lisbon, Portugal. The problem is the extra 5000 or so miles in each direction to get up to Lisbon and back down. It takes an extra day according to flights schedules. The smarter approach is to take South Africa Airways flight 206 out of Sao Paulo Brazil nonstop to Johannesburg South Africa. It connects there with Mozambique Airlines, with a second morning arrival in Maputo at 940am. The flights out of Ushuaia are a 2136 departure on Aerolineas Argentinas to Buenos Aires, a transfer between terminals in Buenos Aires, then a wide assortment of choices to fly to Sao Paulo to get SAA206. The first test of some of my transportation theories will come on Feb. 25 when episode 2 will air (if it isn't preempted by the Oscars). I love La Grande Roue! Sometime after TAR 1 aired--I was in Paris on a cold winter's night...and being the TAR freak that I am decided that of course, I HAD to ride the thing! Given my schedule and hours of op--I think it was about 11PM when I finally made it over there and made my way on board. It was absolutely fabulous! All of the French monuments were lit up for Christmas and the views from the Eiffel Tower to Montmartre were spectacular--truly a magical moment. And since there was absolutely NO sense of motion on the Roue--I stayed on the thing for a LONG time--I think that after my 3rd "go round", they even quit charging me! Good times--and somewhere there is a picture to prove it! What fun to see some of our hard earned clues come to life--thanks for sharing your pictures! No Roue ride for me. The reason I was so excited to see it on this trip is that it had been taken down for some time. It was not there in the summer of 2003 when I brought my kids. Another note is that for the "Art" half of the detour the teams were supposed to take a painting to "this man". And I finally recognized where he was sitting. I should Because he was sitting on the Quai d'Orleans exactly in front of the apartment we were staying at that summer: 30 Quai d'Orleans Click on the "V" to see the view from the living room window. Oh and fyi, Pelican Harbor Marina may not be the exact starting line. Pelican Harbor Marina may not be the exact starting line. I won't spoil it for Chateau, but the hand might seem like a good TAR-thing. I'll throw in another, on spec: parapenting in Iquique. The town is a magnet for the sport: a gigantic sand dune, Cerro Dragon, rises over the city, and steady updrafts make for easy tandem flights (helmet-cam here). I think that The Early Show footage was filmed not at Pelican Harbor Marina itself, but at Pelican Island , the little island at the top in the picture--located about 400 yards offshore from the marina. But do they actually LEAVE from somewhere else? Spill the beans puddin! Maybe its Pelican Island? I just heard it doesn't start at the Pelican Harbor Marina , i have no specifics. Trade you for telling you where the hand is! Shoot...I have to go pretty soon! Slowhatch That para-gliding thingy would make an AWESOME task! Scary...wouldn't want to splat into the side of a building on that beach! That's not OUR Pelican Island--that is The Pelican Island National Wildlife Refuge located up in the Indian River in Sebastian Florida--up near Vero Beach. When I was looking for OUR island--I kept getting diverted here--which is one of the things that made finding ours tricky. How dare they have two Pelican islands in Florida! We know our guys were at our island for sure by TES footage. Where their cars were is still unknown though--the Marina is a possibility but could be anywhere nearby! It's by the same artist that did my "hand" Los Dedos. It may not look it, but it competes with Atacama for the title "world's driest place." Where is it? I knew you would know the Hand, Chateau , now for Slowhatch..did some searching and found McMurdo Sound, Antarctica? Too easy, huh? The Dry Valleys haven't seen rain in thousands of years. Antofagasta in the Atacama desert a giant hand scuplture of fiberglass is the work of Chilean artist Mario Irrizábal. It is known as La Mano del Desierto - The Hand of the Desert - and is a landmark beside the Panamerican highway which runs north south through the Atacama desert. It looks like its a nature park behind Phil so maybe the racers have to run through the park to get to the cars ..........Just saying this because earlier when i was a guest I saw this Question.